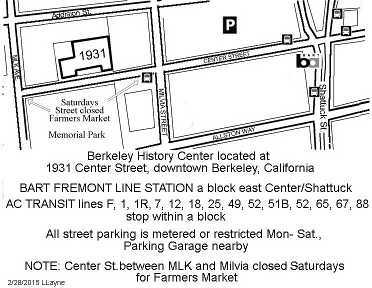 The History Center is located at 1931 Center Street, about halfway between Milvia and Martin Luther King Jr Way, 1 1/2 blocks west of the Downtown Berkeley BART station. Several AC Transit bus lines serve the downtown Berkeley area. Parking in front of the History Center is metered but unavailable on Saturdays due to the Farmer's Market. Parking west of Martin Luther King Jr. Way is neighborhood restricted - 2 hour limit for non-residents. There are two parking structures in the block east of the History Center on Center Street.